James Johnson is proving his worth this season as he continues to display that he can work both ends of the floor. Double digit scoring to go with eight rebounds, two steals and a block? You can't complain. A career-high in rebounds for Amir last night. While DeMar worked the offensive end, Amir was on the other end grabbing boards and blocking shots. It doesn't surprise me that the Charlotte Bobcats snapped their 16-game losing streak against the Raptors last night. 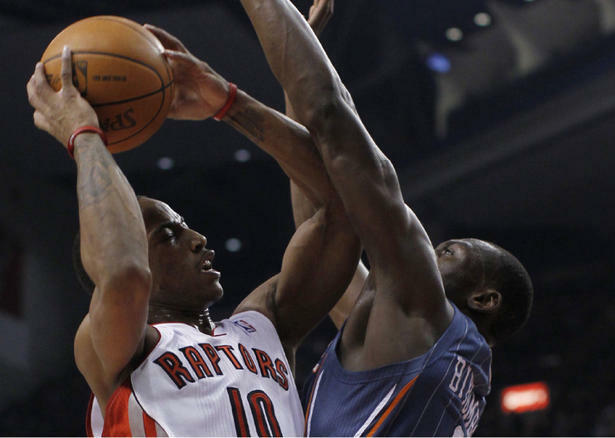 It's just what happens to the Raptors....and on top of that Bismack Biyombo had career-highs in rebounds and blocks. Ugh.